Wedding ceremony on the sunny seaCoast - what can be more beautiful? Romance surrounds everywhere: the tropics, exotic cuisine, bright flowers, soft rustle of waves, snow-white beach sand, rhythmic bewitching music. However far not all brides manage to translate dreams into a reality. What if there is no possibility to go to the southern regions? You can transfer the atmosphere of the southern coast, even to the snow-covered Moscow, if you arrange a wedding in a marine style. 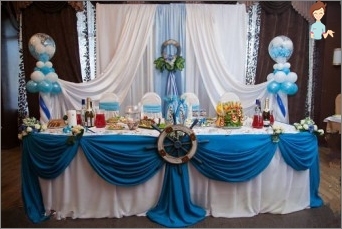 First of all, you should prepare a script for a wedding in a marine style and, in accordance with it, decorate the hall. A party on the sea beach can also beIs adequately represented in the banquet hall, if you pick up exotic fans, tomtams, arrange pots with palm trees and prepare a necklace of flowers for each visitor entering the guest hall. 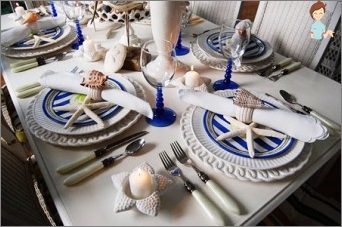 Add the atmosphere of a festive evening aquariums, as well as an abundance of fabrics of white and blue hue. If a couple really lives on the coast, you canTo realize the dream of almost all the girls - to arrange an incredibly romantic performance, during which Gray will meet with Assol on board a rented white yacht, of course, exclusively with scarlet sails. Are dangerous adventures dangerous? You can equip the venue with a "secret room" in which pirates hide a beautiful hostage. Let the captain-groom first prove that he is worthy of such a bride, having passed a series of tests and having paid "Sea wolves"A decent ransom. 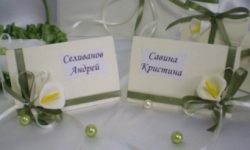 It's great if among the friends of the newlyweds there isGuys, able to organize a party with an interesting and funny script. If the imagination is not the best quality of friends and acquaintances, it's easier to order the script from professional animators. In this case, even in the snow-covered Siberia it will be possible to completely immerse in the atmosphere of the southern coast. Invitations to a wedding in a marine style alsoYou need to withstand the general design. At a pirate party, you can collect guests by sending out black tags, and in the realm of the little mermaid to call, sending out cards in the form of an elegant shell. 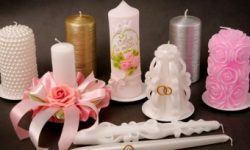 The invitation should show which style was chosen for the solemn event. Perhaps the guest decides to appear in the thematic costume? The main colors of the maritime style dominate here - blue and white. You can arrange glasses on the tables with candles,Filled with golden sand, river pebbles and beads. In the light of a living flame, the transfusion of sand and rhinestones will give a truly magical mood, comparable to the atmosphere of an exciting adventure. At the same time, do not overdo it withAttributes, filling them with all the free space. 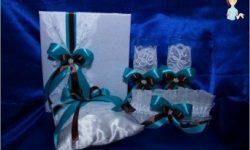 It is enough to single out bottles of wine or glasses in a special way, decorating them with strips of blue and white shades. Guests should have enough space to enjoy the holiday. Usually on such holidays prevailsMediterranean Kitchen. However, it should be noted that not all guests like mussels, sea urchins, oysters. Therefore, it is worth taking care of an alternative menu that will not allow the guest to leave the table hungry. And to place traditional dishes is better in the dishes executed in the form of a bowl. Particular attention should be paid to the main course -Cake. Professional culinary specialists are able to perform miracles and fulfill the order in full accordance with the wishes of the client, even in the form of Jack Sparrow's head. Of course, the appearance in the banquet hall in the suit of sea vagrants will undoubtedly make a splash. Guests are usually asked to dress appropriatelySubject, adhering to the general color palette. If the script of the evening involves a production action, the costumes of the main actors of the roles should be taken care of in advance, and not to inform the guest of his fate in the show at the last moment. On the hood of the car you can place the steering wheel or anchor, and the driver dress up in a vest. A maritime-style wedding should leave memories for life. The main thing is that everyday life reminds of tender warm waves, and not the sea during a storm.